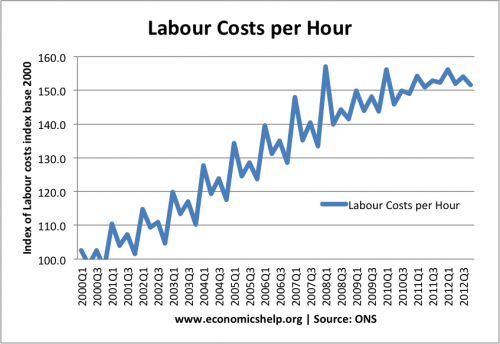 A new series from the ONS shows an index of labour costs per hour. (this is an experimental series and looks as if it is not seasonally adjusted) Labour costs seem to be persistently highest in Q1. 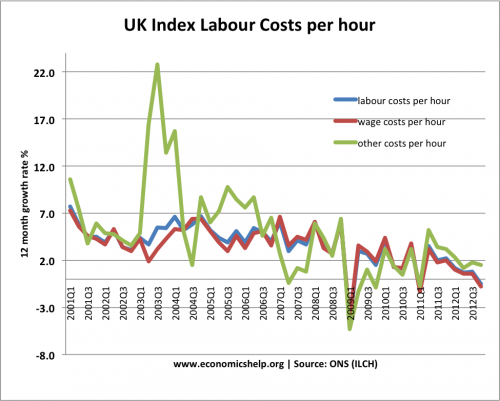 As expected, since 2008, we have seen very modest increases in unit labour costs. In the last quarter Q4 2012, labour costs were actually 0.8% lower than the previous quarter in 2011. Unit labour costs are closely related to wage rates. 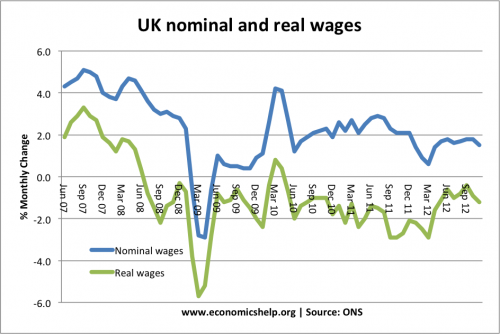 See: UK wage rates It is also useful to compare unit labour costs to the overall inflation rate, with inflation running at 2.7%. Other features of UK unit labour costs. Since 2000, public sector wage costs have increased at a similar to private sector wage costs. 1. Competitiveness. Falling unit labour costs is an important factor in increasing the competitiveness of UK industry. Lower unit labour costs should make UK exports relatively more competitive, helping to boost exports. However, the benefit of lower labour costs is offset by the fact that during the current EU recession, EU labour costs are also falling. 2. Current account. If unit labour costs can become more relatively more competitive, this will help to improve the current account. 3. Inflation. Wage rates and unit labour costs are an important determinant of inflation. If unit labour costs fall, firms will be able to cut costs and cut prices. Also, with stagnant wage growth, consumers have limited disposable income, reducing any demand pull inflation. This entry was posted in A-Level and tagged inflation. Bookmark the permalink. ← To what extent did EU recession cause UK recession?